Budget is tight chez Cheetor so the majority of the figures used are the guys from Black Reach, with a few simple conversions here and there. 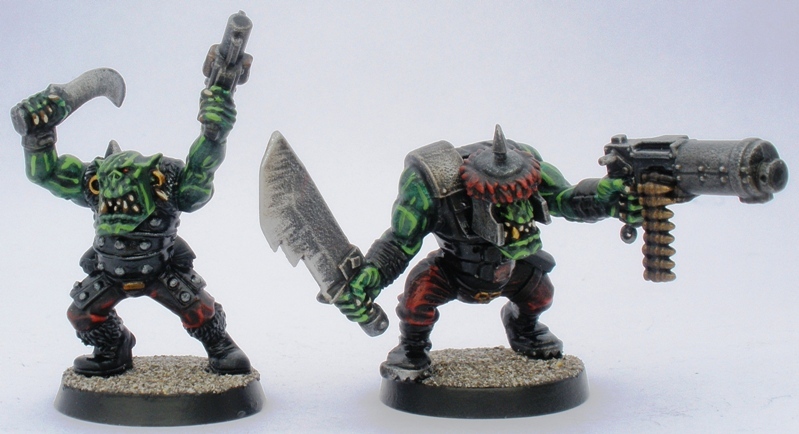 I also used one box of Ork Boyz plus a few bits that I got on ebay. I tried to ensure that the paint job would be easy and quick to replicate as I didnt want to get bogged down in a complicated scheme. I tried out a couple of others on test figures until I got one that worked for me. It ended up being a pretty traditional scheme. Its not showcase army standard or anything but it is pretty neat and has enough contrast to look good on the table I think. A Black Reach Nob and a Yoof made from GoMo plastics with a modern head. A Yoof and a boy. 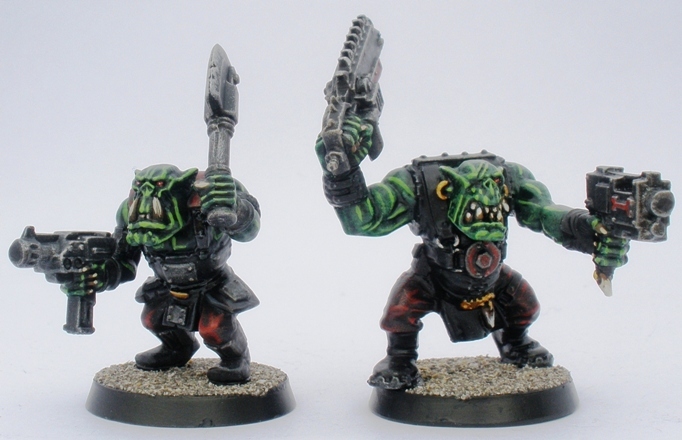 Two Yoofs and a Rogue Trader era cybork. The last Yoof and a Shoota boy. The cyborks below have magnets inserted at the waist. As I was running out of torso parts from the Boyz set I only have two cybork torsos and six pairs of legs (from Kromlech). That why the torsos repeat in the next three photos. 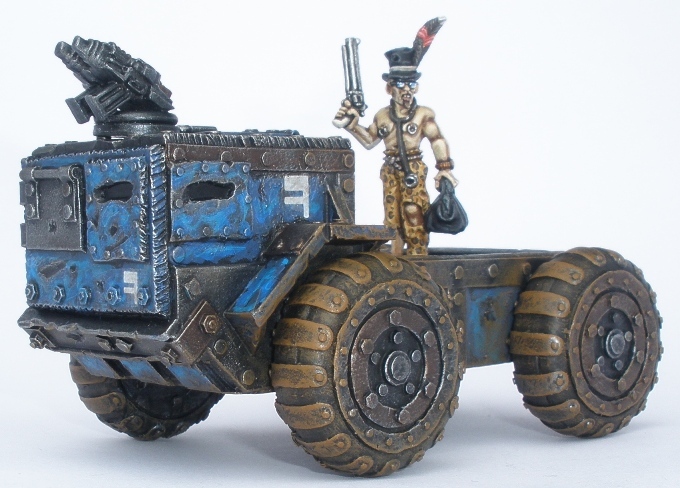 I painted up three resin vehicles from Ramshackle Games for the Bigdogz. 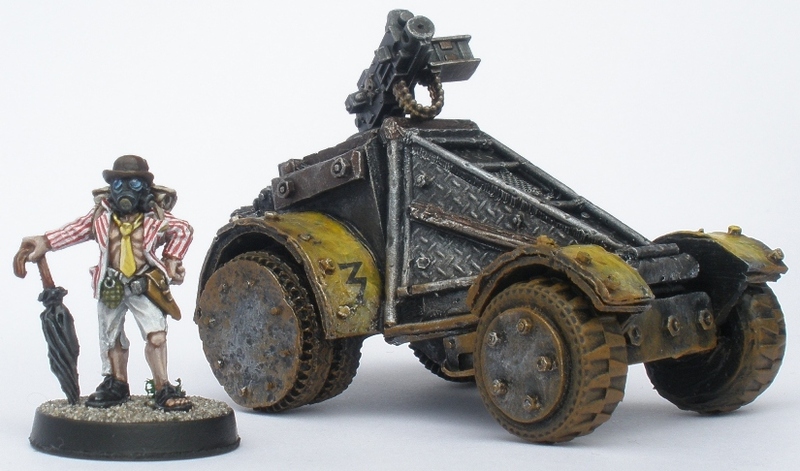 Although they are painted primarily for use in GoMo I wanted them to be suitable for use in other post apocalyptic games. Therefore I avoided using specifically orky iconography. That is also why the photos include some post-apoc humans as well as orks. I have more figures than I need painted up for GoMo now but I will continue until I have painted up the remaining fifteen or so that I have, largely because I have enjoyed the ork painting project a whole lot. 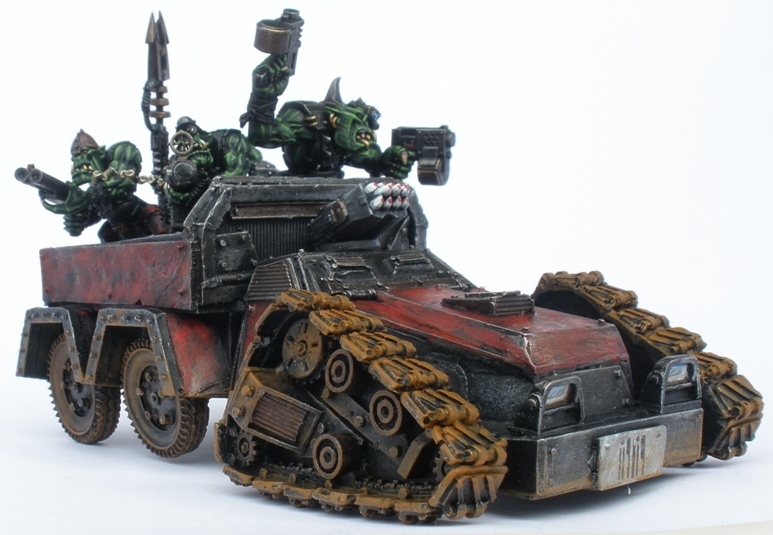 More details regarding my ork related stuff can be found on my blog if you are interested. Good luck to you then, I hope you will be posting in the GoMo forums soon! 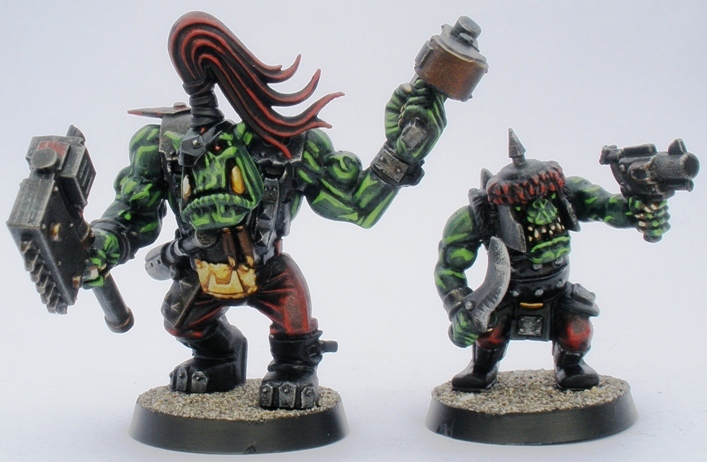 first things first: welcome to Da Waaagh!! Enjoy your stay!! nice idea with the old body+new head for yoofs. Looks a bit off but certainly gets the idea through. And finally I see the kromlech stuff in use. I'll have to grab it sooner or later, very sweet!! Thanks. I have some GoMo planned for next weekend. I will be taking photos and recording some of the games so I may post on the GoMo forums after that. 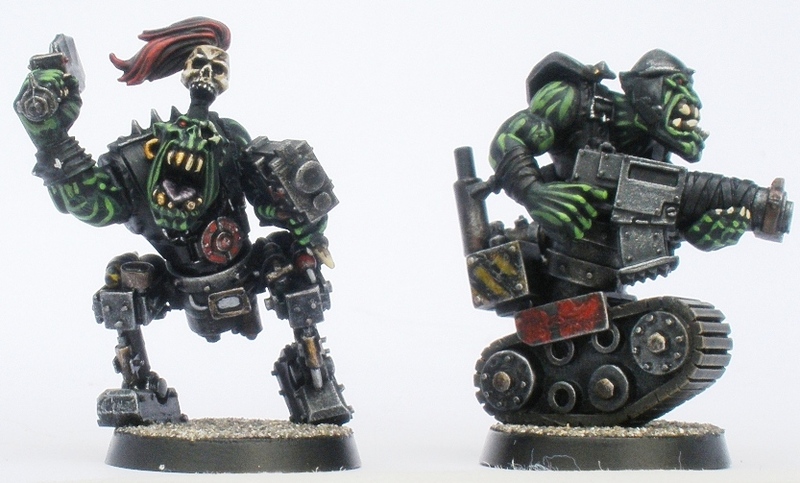 first things first: welcome to Da Waaagh!! Enjoy your stay!! nice idea with the old body+new head for yoofs. Looks a bit off but certainly gets the idea through. And finally I see the kromlech stuff in use. I'll have to grab it sooner or later, very sweet!! The Kromlech cybork stuff is great. I ordered the cybork arms once I saw the quality of the "legs". They are fantastic. Is that a heroquest ogre I see there? 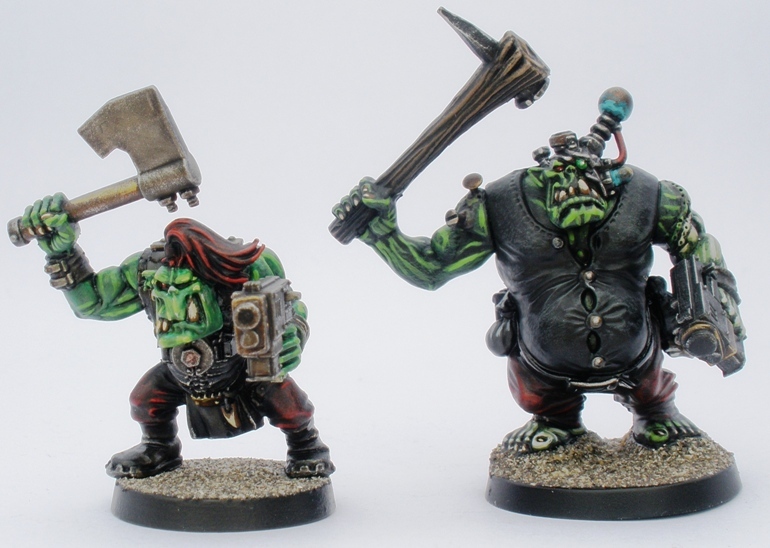 Video Tutorial on Painting Orks with (mostly) washes! 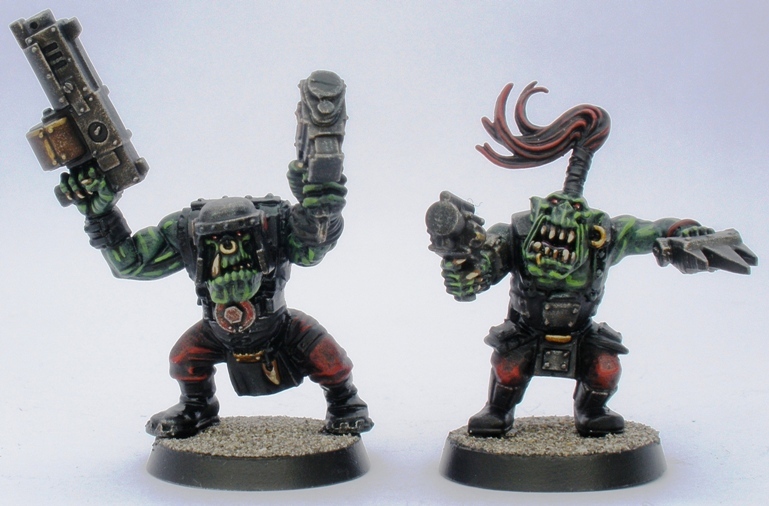 Those bodies go surprisingly well with the current ork heads actually. 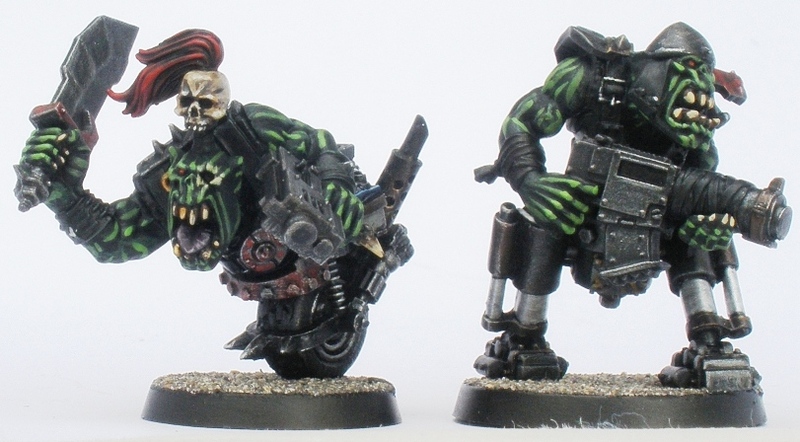 I would rather that they were not barefoot, but for Frankenork (or a Snake Bite Nob) they are chunky and fun. Ahh, hero quest ogre conversion, good work. 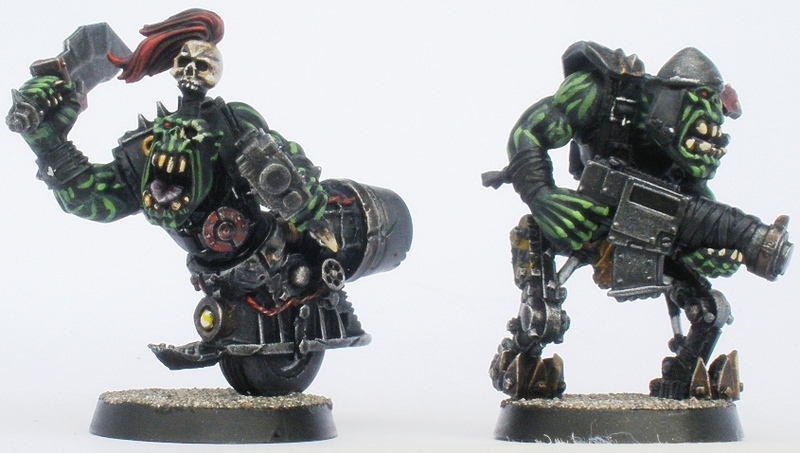 These are great models and lovely paint jobs! I have had problems painting vehicles in the past but I actually enjoyed painting the three Ramshackle vehicles shown here. I like the Yoofs...that is just brillant. I might have to take that idea..lol good stuff there.